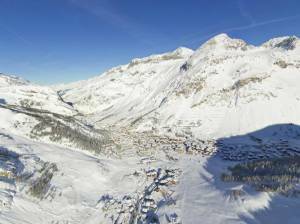 Broomfield, CO – Vail Resorts has added Les 3 Vallées, Paradiski and Tignes-Val d’Isere in France, Skirama Dolomiti Adamello Brenta in Italy, 4 Vallees in Switzerland, and Arlberg in Austria to the 2016-2017 lineup of the Epic Pass, which offers unlimited, unrestricted skiing access at the company’s 13 ski resorts in the U.S. and Australia. Europe is the birthplace of skiing. That tradition, along with its above-tree line terrain, its cutting-edge après-ski experience, and abundant culture and heritage found in the surrounding mountain towns makes Europe the ultimate dream for any skier or snowboarder. The 2016-17 Epic Pass offers unlimited access to Vail, Beaver Creek, Breckenridge, Keystone and Arapahoe Basin in Colorado; Park City in Utah; Heavenly, Northstar and Kirkwood at Lake Tahoe; Wilmot Mountain in Wisconsin; Afton Alps in Minnesota; Mt. Brighton in Michigan; and Perisher in Australia. The Epic Pass allows pass holders to visit resorts as they choose, each with its own personality and distinct experience. While the best deal on the Epic Pass has already passed, it’s still for sale at a marginal premium at EpicPass.com. 3 Vallées, Paradiski and Tignes-Val d’Isere — offer a unique playground to skiers and snowboarders from all over the world, accessing five glaciers, 391 ski lifts and over 800 miles of marked runs for all ability levels within a 30-mile radius. The three areas combine high-altitude skiing for dependable quality snow from November to May with stunning views of Mont Blanc and a 360-degree panorama of the French, Swiss and Italian Alps. Verbier, part of the 4 Vallées ski area, is the largest resort in the Swiss Alps, is acknowledged as one of the premier “off piste” resorts in the world, and is home to a number of professional freeride competitions. Above and beyond this reputation, Verbier is well-known internationally for its electrifying, cosmopolitan nightlife, and the resort is proud of its legendary après-ski and its lively clubs. While skiers and snowboarders from all over the world rave about this off-piste paradise and fun evenings, families also appreciate the resort’s social atmosphere and family-friendly offerings. For decades, the mountain range between Tyrol and Vorarlberg, which is home to Arlberg, has been a highly sought-after metropolis for international ski and snowboard enthusiasts. Arlberg is widely considered the cradle of modern skiing and in December 2016, thanks to the opening of four new cable cars, it will be Austria’s largest linked ski area. Also the birthplace of champions, athletes from Ski Club Arlberg have garnered an incredible 83 medals at various Olympic Games and World Championships. “For value, for ease of use, for access to world-class destinations, for constant improvements in the guest experience, and now for being the only pass to offer significant access to Europe, the Epic Pass is in a class by itself,” Lynch said. The Epic Pass benefits at each European resort vary. Consult epicpass.com for full details.